Visit one the most beautiful village of Liguria and immerse yourself in both romantic and medieval atmosphere. Millesimo is one of the most beautiful villages in Italy. The village has a romantic center and features numerous interesting attractions. A medieval character is created by the house façades of the main street and the Pontevecchio Gaietta bridge. Moreover, there are still some old castle ruins near Millesimo in which events are held partly also in the summer. The Napoleon museum which is located underneath the Castello Del Carretto castle is also worth a visit. A romantic church, the Santa Maria Extramuros, which contains precious Gothic fresco paintings, can be visited. The big pilgrimage church of Santuario Della Madonna Del Deserto, situated on the upper side of the locality, to which pilgrimages are still being organized even today, is also particularly recommendable. The truffles, which also have a special festival dedicated to them in the autumn, are a specialty from Millesimo. The region also has a particular attraction for the sport enthusiasts. Beautiful hiking paths and cycling tracks run through the Parco Naturale Regional di Bric Tana which is found around Millesimo. A big reservoir lake, the Lago di Osiglia, is located very close to Millesimo, approx. 15 km away. Even water sportsmen get their moneyÂs worth in this place. The origins of Millesimo can be traced back to a Roman post which was stationed at the Roman road junction between Cengio, Osiglia and Colle Melogno. There were several attacks by the Saracens in the area during the 10th century. Millesimo was given to Henry del Vastro as a fiefdom in 1162, and the latter’s son, Heinrich II Del Caretto, enclosed the village and the castle with new walls. In addition, an important bridge, the Gaietta bridge, was also constructed. In 1447 Millesimo became involved in the war between the Republic of Genoa and the Lords of Finale, whereby Millesimo was fighting on the side of the Lords of Finale. They were defeated in that war and were subsequently handed over to the Marquise of Montferrato. In 1577 the vanquished were placed under Spanish rule. It was under Austrian rule that Millesimo was sold to the Sardinian kingdom. The participated in the 1796 battle against Napoleon and lost. Millesimo reverted back to the Ligurian Republic in 1797 through the French rule. They were integrated into the Italian kingdom in 1861. From 1973 to 2011 Millesimo was the seat of government for the mountain community of Alta Val Bormida. 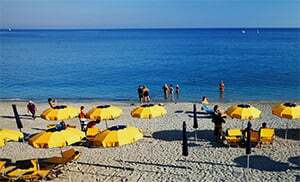 Millesimo is one of the localities in the province of Savona, which lies in the Liguria region. There are several other villages near Millesimo, and they include: Montecala (4 km), Martinetto (1.8 km), Cosseria (4.7 km). Take the A6 to Torino from the direction of Savona and branch off near Millesimo.